the US had been moving west anyway; in the 40s it becomes the express goal of the nation to move all the way west, from "sea to shining sea"
however, the land belongs to Mexico, where slavery has been abolished; so, they argue that they were "lifetime indentured servants"
Calhoun defends slavery as a "benign institution"
also, he will settle American claims against the Mexican government for lives lost, etc. was the war started on the US's side of the border? 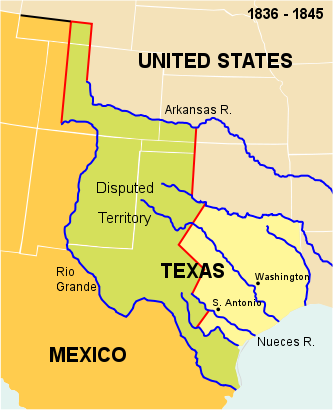 and, what is the border - the Rio Grande or the Nueces? viewed the war as a brazen conspiracy to extend the boundaries of the "peculiar institution"
Harriet Tubman was known as the "Moses of her people"
John Greenleaf Whittier, in his poem, "Icabod", about Webster: "all else is gone from these great eyes … the man is dead"
the slave trade is abolished in D.C.
the Compromise of 1850 wasn't a "be-all, end-all"
southern writers try to defend slavery as "benign"
this issue is beginning to consume the entire nation, and conflict spreads to other areas: immigrants v. natural-borns, Catholics v. Protestants, Christians v. Jews, etc. the anti-Jacksonians objected that the Court had been "sullied" by a "political hack"
Douglas replies, "In order for slavery to exist, laws were necessary to protect it. If no such laws were established, slave-owners would not reside there and the territory would be free." he is funded by the wealthy "Secret Six"
the news spread, and Brown hoped that droves of slaves and sympathetic whites would join his cause; however, this area had very few slaves, and those in the area were described as "well-off"